Knights of Creativity Spirit & Ale: Fangs for the Memories. Enjoying Bowies notes the other day, that Arizona State USA..is crawling, literally, with rattlers, I was tempted to bring up again, the subject of Snakebite, That quintessential half Stella Lager / Half Scrumpy Cider Pint that is generally "Illegal" to sell as such in the UK ... as a few of them can generate the need to fight, quicker than you can say " Are you looking at my wife"
But this item in the world news, caught my eye, and I thought worthy of its place on the blog, firstly because you shouldn't try this at home....and secondly its good to see beer drinking done the world over with such fun and optimism. A Cambodian man who took off his trousers, tied the legs at the bottom and wrangled a 2-metre cobra into them died when it bit him through the fabric, local media reported Monday. Khmer-language daily Koh Santepheap quoted police as saying Chab Kear, 36, saw the reptile swimming in a river just outside the capital last Thursday during a drinking session and captured it in the hopes of selling it later in the day. He tied the animal inside his trousers and a scarf around his waist, but as he continued carousing the enraged snake managed to get its fangs free and bite Kear three times on the stomach. 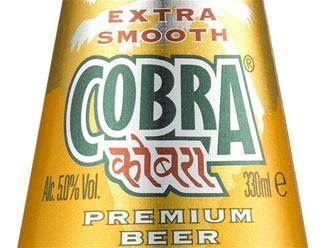 The newspaper reported Kear's last words as being "don't worry - it's nothing a drink can't fix" before he succumbed to the cobra's venom. 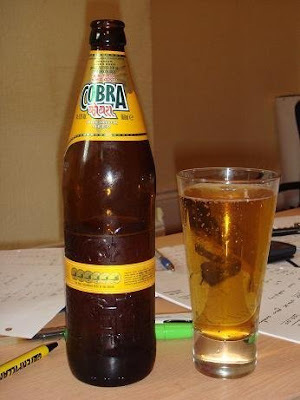 "The newspaper reported Kear's last words as being 'don't worry - it's nothing a drink can't fix' before he succumbed to the cobra's venom." Wow, now that have to be made into a Knights poster of some sort. That's a story I could sink my teeth into. His "Memorial Phrase" reminds me of one of my favorite black bartenders who is fond of saying, "It's nothin' but a move."